Institutional Review Blog: DOJ: "There Is No Academic Privilege"
DOJ: "There Is No Academic Privilege"
As reported in Inside Higher Ed, the Department of Justice has filed a brief in the British government's effort to gain access to oral history records at Boston College. The Department asks the court to honor the U.S. attorney's subpoena on the grounds that "there is no academic privilege which shields the material from disclosure." The DOJ brief argues in the alternative when it comes to the important question of whether oral historians are like journalists. On the one hand, it suggests that the Boston College researchers are mere academics, and seizing information from them should be easier than prying it from reporters "because the Constitution and the courts have long recognized the unique role which news reporters play in our constitutional system. See, e.g., Branzburg, 408 U.S. at 681; New York Times Co. v. Sullivan, 376 U.S. 254, 268-71 (1964). The limited protections afforded news reporters in the context of a grand jury subpoena should be greater than those to be afforded academics engaged in the collection of oral history." The brief does not explain why this should be so. In Sullivan, the Court applied the same reasoning to the four private individuals sued by Sullivan as it did to the New York Times. The informative function asserted by representatives of the organized press in the present cases is also performed by lecturers, political pollsters, novelists, academic researchers, and dramatists. Almost any author may quite accurately assert that he is contributing to the flow of information to the public, that he relies on confidential sources of information, and that these sources will be silenced if he is forced to make disclosures before a grand jury. Perhaps sensing this problem, the DOJ brief goes on to argue that even a journalist, if confronted by the same subpoena, could be forced to disclose the information under Branzburg. said that many courts have "recognized that academic scholarship is deserving of specified protection and that such protection requires a balancing approach in attempting to ensure that investigative demands are sufficiently factually based and narrow so as to limit the potential chilling effect these types of requests might have on future academic research." I would be interested to see a full version of that argument. Boston College Subpoena News website following Boston College's motion to quash the DoJ subpoena. Court documents, background information and news media available on the site. This blog seeks to inform the debate over IRB review of research in the humanities and social sciences by collecting breaking news, commentary, and background information on the subject. It is maintained by Zachary M. Schrag, Professor of History, George Mason University. 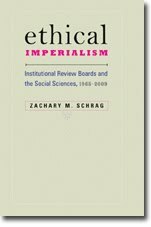 His book, Ethical Imperialism: Institutional Review Boards and the Social Sciences, 1965-2009, was published in 2010 by the Johns Hopkins University Press. Suggested citation style: Zachary M. Schrag, "Smithsonian Frees Oral History, Journalism, and Folklore," Institutional Review Blog, 30 July 2010, http://www.institutionalreviewblog.com/2010/07/smithsonian-frees-oral-history.html. The views expressed here are my own and may not reflect those of George Mason University. Each entry in the Institutional Review Blog by Zachary M. Schrag is licensed under a Creative Commons Attribution-NonCommercial-NoDerivs 3.0 Unported License. To be published, a comment must include the author's first and last names, and institutional affiliation as appropriate. It must also be responsive to the post to which it is attached. Schrag, “The Case Against Ethics Review in the Social Sciences.” Research Ethics 7, no. 4 (December 2011): 120–131.